EEMPL have now added custom stators to their range of automotive grade magnetic products built in their IATF16949:2016 qualified factory. These devices are now available from Luso Electronics. 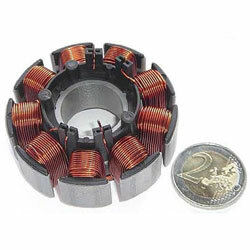 These stators are used for small electrical motors, the application EEMPL regard for them is as waterflow valves in EV and PHEV cars and are currently in development with two major automotive manufacturers. As typical for this sort of device there are no standard parts as each part is created to satisfy each customers’ specific application requirements.